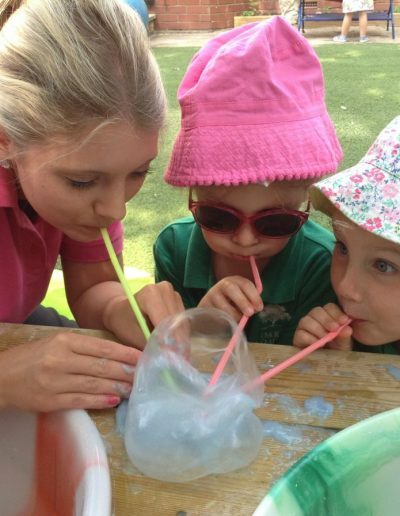 ART AND CRAFTWORK: The children enjoy a wealth of opportunities to express their creativity using different mediums in their art and craftwork. 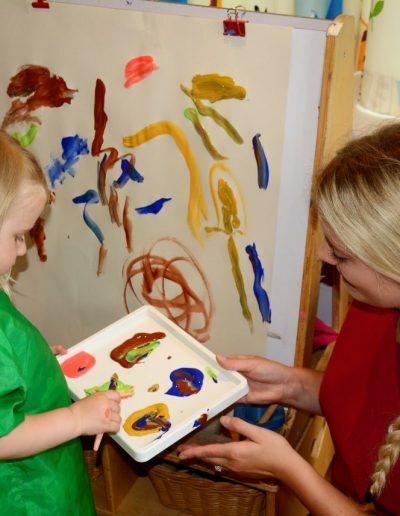 the children are encouraged to select their chosen resources from different types of paint, pastels, wax and pencil crays, felt tip pens, pencils, chalk and charcoal together with various papers, card and and board. 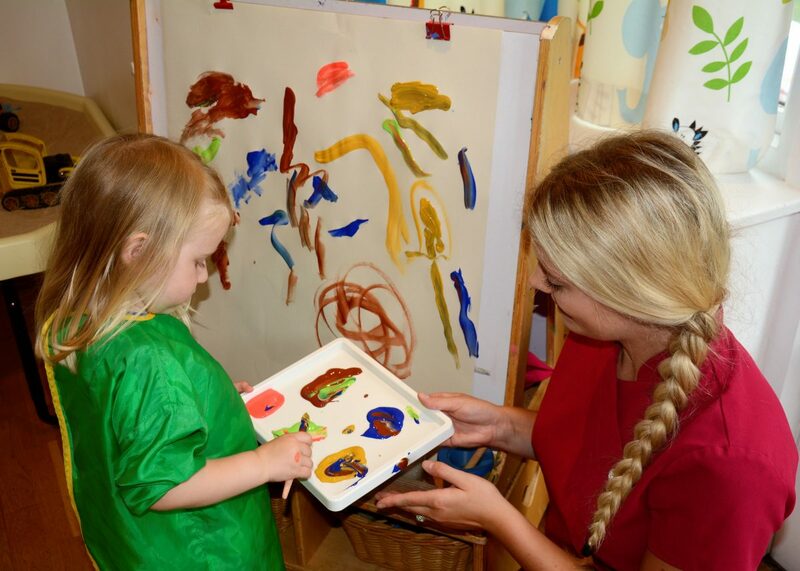 Although children are encouraged to make choices to reflect their individuality they are also gently guided by staff to enable them to develop the skills they need to reach their potential. 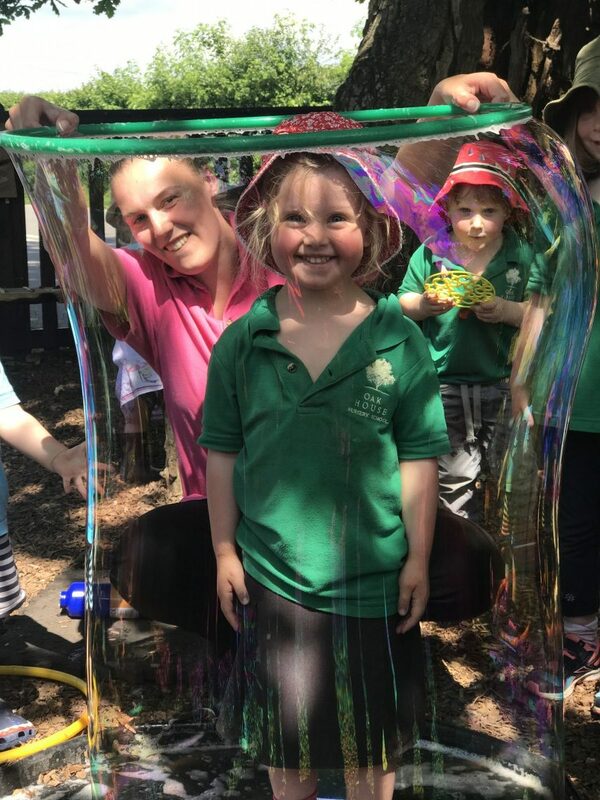 ARTIST IN RESIDENCE: We are incredibly fortunate to have Rosie Watts as our Artist in Residence at Oak House Nursery School. Rosie brings a million and one creative ideas to the Kindergarten children – she lets their imaginations run wild and enables the children to completely amend the plans depending on how they view the projects! MUSIC: Music and Song can be heard resounding throughout the Nursery at all times of the day, through spontaneous singing by staff and children and during planned Music Sessions when the children enjoy experimenting and ‘music making’ with a wide range of high quality percussion instruments. A wide variety of recorded music is also played throughout the nursery ranging from nursery rhymes, songs from the Musicals to classical music and lullabies. 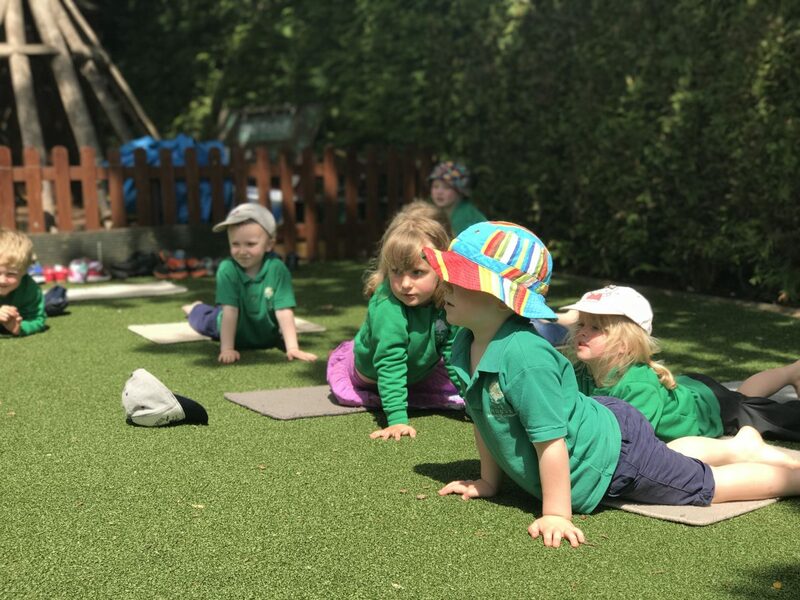 Music is an important part of our provision and the children often move freely and dance around to the rhythm and beat of the music they hear. 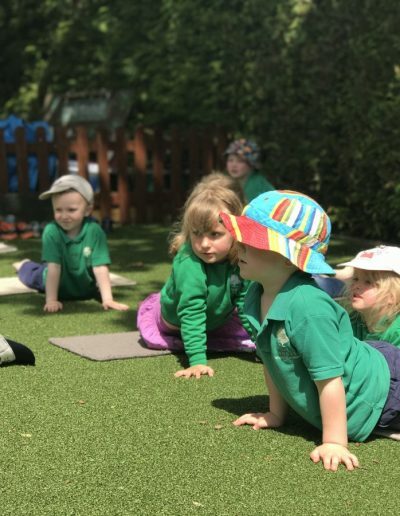 ‘Song Time’ is an important part of every session and the children learn the words and tunes to all the traditional nursery rhymes and songs and in celebration festivals within both the Christian calendar and many other religions. DRAMA: We love Events at Oak House, as these are a wonderful opportunity to showcase the skills learnt by the children at different ages. The Nativity Play and Spring Concerts are highlights of the calendar, when the children learn lots of songs, dance and short lines – enabling Parents and Families to really enjoy their child’s dramatic side! 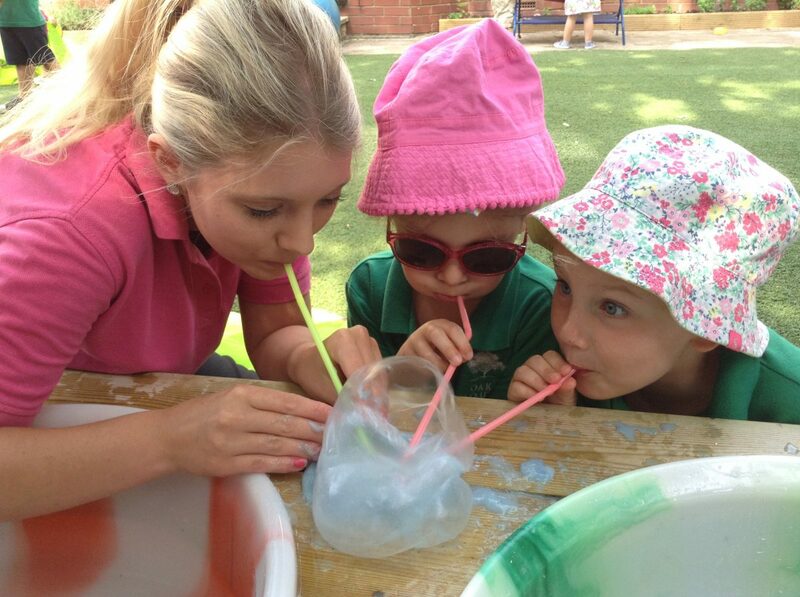 SCIENCE AND INVESTIGATION: From their first days with us, we expose children to the wonderful world of science and investigation – encouraging them to use their creativity and to build upon their knowledge to learn about HOW and WHY things happen in the world around them. We take the children for lots of walks around the Village – listening to the sounds of nature, and looking for growth and decay around them. BABIES – explore a wide variety of everyday and natural resources in various ‘Treasure Baskets’ in their playrooms. 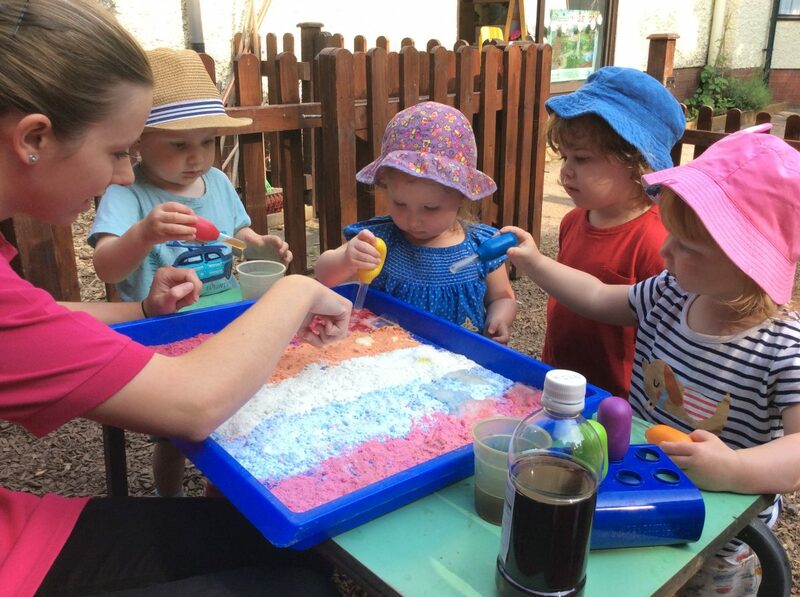 TODDLERS – explore natural and everyday items in their ‘Heuristic Play’ in the lounge where it is quiet and peaceful and they can investigate the resources without disturbance or interruption. 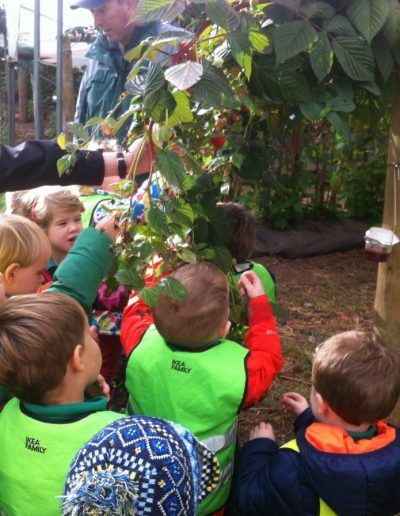 KINDERGARTEN – explore natural resources both in their classrooms and outdoors and in our ‘Forest School Area’ under the old Oak tree. 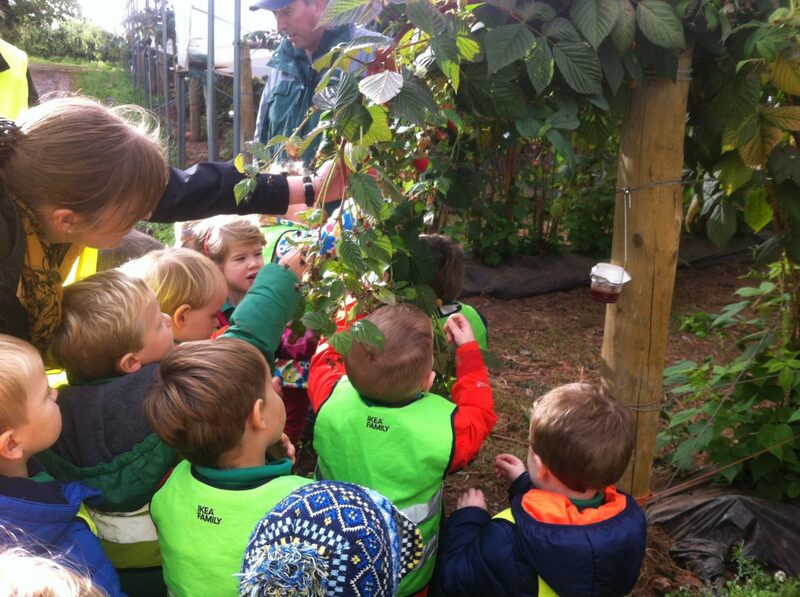 COOKERY: To enhance children’s understanding of food and where their meals come from, and the impact of healthy choices on their holistic health, our children enjoy Cookery Classes. 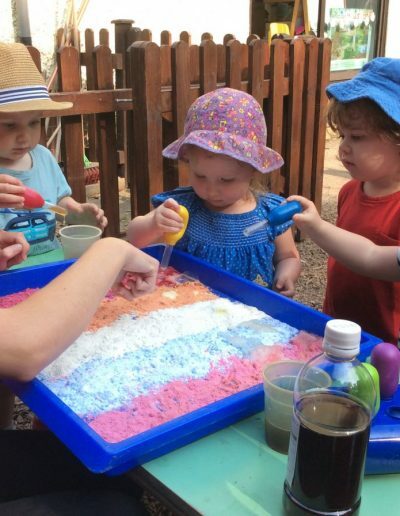 Children are involved fully in the process: from examining the ingredients, mixing, chopping and pouring, in order to encourage and develop independence skills. BOOKS AND STORIES: We believe that children should be immersed in both the spoken and written word and provide a wealth of lovely picture books for the children to be able to look at and enjoy throughout their days in the nursery. We spend time both on a one-to-one basis and in groups, reading, talking about and sharing stories and picture books with all our children to encourage a positive approach and develop and love of books.